The Silver American Eagle coin is the most popular silver bullion coin in the world, and the annual best seller as well. The Silver Eagle was introduced in 1986 as the official silver bullion coin of the United States, and has proven a staple of the industry during times of economic stress and rising silver prices. 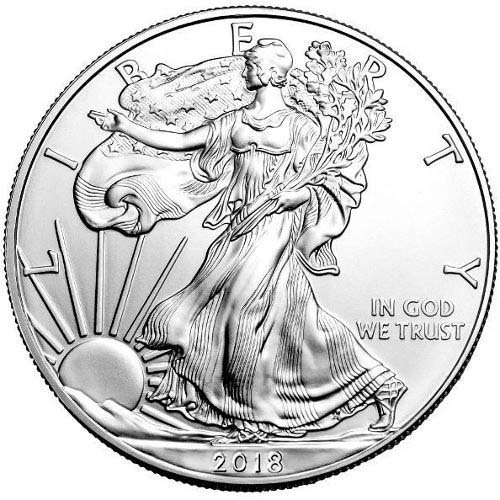 Right now, 2018 1 oz Silver American Eagle Coins are available to purchase online at Silver.com. Ships to you inside protective flip, within mint tubes of 20 coins, or inside Monster Boxes of 500 coins! 33rd release of Silver American Eagles! Adolph A. Weinman’s Walking Liberty graces the obverse. John Mercanti’s refined image of the heraldic eagle of the United States. All 2018 1 oz Silver American Eagle Coins listed here today are in BU condition. Coins in BU condition exhibit no signs of wear and tear, though you may notice minor flaws resulting from the coining process. These flaws include breaks in the luster, spotted surfaces, and contact marks. Silver American Eagle coins became record-setting bullion products during the Great Recession. The United States Mint had, prior to 2009, only seen demand and mintage for the Silver Eagle surpass 10 million in a single year on three occasions. The first came in 1987, just the second year of availability. The second came in 2002, and the third came on the 20th anniversary of the series in 2006. During the Great Recession, the Silver Eagle would smash previous mintage record and set new ones on a regular basis. In 2008, 20.583 million coins were sold. In 2009, 2010, and 2011 the Silver Eagle would break records each year. After a blip in 2012, new records were set in 2013, 2014, and 2015, peaking at 47 million coins sold in 2015 alone. On the obverse of all Silver American Eagle coins is Walking Liberty. This depiction of Liberty as she strides toward the setting sun is said to be indicative of the nation’s constant march toward a brighter future, never allowing the sun to set on the great American experiment in democracy. 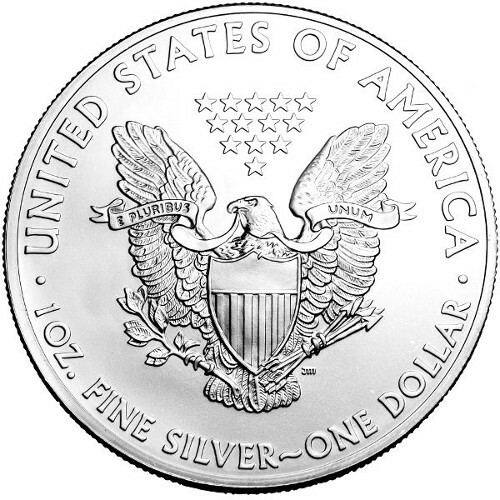 The reverse of the 2018 1 oz Silver American Eagle coin has the same design as always: the heraldic eagle. First used in 1794, it is routinely updated throughout time. This 1986 adaptation came from then-US Mint engraver, soon-to-be Chief Engraver, John Mercanti. It depicts the eagle behind the national shield and includes the arrows of war, olive branch of peace, and 13 stars reflecting the original colonies. I’ve been ordering for the past year and my coins always come in mint condition and wonderfully packed. Plus my coins are received very quickly. I purchased several silver coins in five different shipments and all the coins were in perfect condition. You could not ask for more. And the customer service is very very good. 2018s in first order, 2017s in 2nd order. Totally happy. Very fast service, coins in mint shape. I highly recommend this company! Who knows how long silver will go down. But I bought just last week, and I’m telling you that you should buy now! See what the price is tomorrow, and give them a call. Best prices anywhere. Thanks again, Silver dot com! Awesome coins, and on time as usual.